One of the oldest and longest-running “races” in North America, and one of the largest, the Des Plaines River Marathon will be starting for the 60th year on May 21, 2017. The “original” race course runs from Oak Spring Road in Libertyville to Dam # 2 Woods in Mt Prospect – just short of 20 miles if you paddle a straight line. There is a short “Minithon” that runs for about 5 miles and ends at the same place as the long course. Some of the fastest and best paddlers in the Midwest race the course in pursuit of “Ralph,” the trophy shaped like a voyageur and nicknamed Ralph for Ralph Frese, founder or the Race. Watch them as they flash past you, admire their technique and fitness. This year the course will be DAM FREE for the first time in over 100 years. Just in case some of our readers may not know – there is a great canoe museum in Spooner, Wisconsin. And, coming up on May 27, is the 2017 Canoe & Wooden Boat Show. Yes – we know – many of you paddle the rotomolded plastic kayaks, SUPs, or fiberglass canoes – but there is always room for some beauty. So check out the event and if you are the lucky owner of one of those beautiful boats – call the museum and see if you can display it. Have fun! WCHM invites participants for its eighth annual Canoe & Wooden Boat Show, to be held in conjunction with Wisconsin Canoe Heritage Day on May 27, 2017. This one day free event will also include museum tours and open house, the unveiling of new displays, ongoing activities in the canoe workshop, and live music and food and beverage in the beer garden. 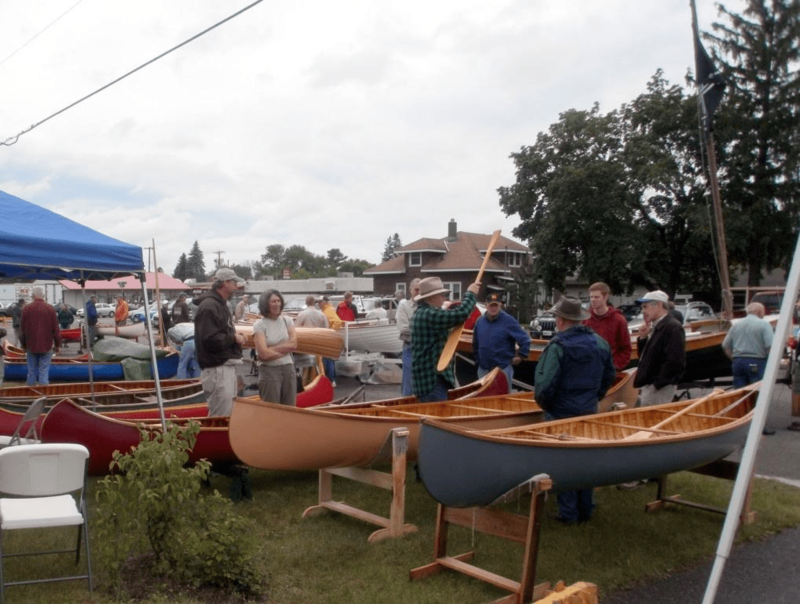 Now is the time to make plans to be an exhibitor and display your canoe, wooden boat, or other canoe related items of interest. Wooden boats of all shapes, sizes, and designs are welcome, both classic and modern, as well as all kinds of classic and vintage water and paddling related items. Whether you have items to sell, or you just have something to show off, there will be many interested folks attending this free event. Exhibitors can include individuals, commercial entities, non-profits, authors, government agencies, educators, crafters, and businesses whose products or services are relevant to boaters and wooden boats and canoes. Booth space is free, and reserving a space is easy. You can download a booth reservation form from the WCHM website at www.WisconsinCanoeHeritageMuseum.org, or request one by emailing to info@wisconsincanoeheritagemuseum.org or calling 715-635-2479. Wisconsin Canoe Heritage Day is produced by the WCHM each year on the Saturday of Memorial Day weekend. How Many Miles Do You Want to Paddle? Rumor has it that an IPC racer wants to do the 100 Mile Challenge in ONE day! The non-profit Water Sports Foundation (WSF) announced today the release of a specialized paddle sports safety logo designed for, and approved by, the U.S. Coast Guard’s Office of Boating Safety. The Coast Guard has promoted its popular Boat Responsibly logo for many years, but with an extra emphasis on paddling safety, it became apparent that there needed to be a sister logo designed specifically for paddle sports. For the past five years, paddle sports popularity has grown steadily and so have boating deaths related to paddling. In 2015, according to a U.S. Coast Guard report*, 143 paddlers lost their lives while participating in paddle sports. The trend of increased paddle sports deaths is causing concern amongst the Coast Guard’s Boating Safety Division and paddle sports safety organizations. This news comes during a period that deaths from traditional power boating actually declined. Please read the full press release from the Water Sports Foundation, Inc. here. About 40 paddlers braved the low temperature, high and swift water on the North Branch of the Chicago River from below the Willow Road Dam at the Skokie Lagoons to Linne Woods on Dempster. This event is now sponsored by the Forest Preserves of Cook County http://fpdcc.com/ who provided shuttle service, granola bars, water and many staff to make sure only experienced paddlers would venture onto the water. THANK YOU JUSTIN and everyone at FPCC! And, THANK YOU also to the ten paddling guides from the Friends of the Chicago River http://www.chicagoriver.org/ who contributed their skills as safety boaters. Three members from OctaneRichMedia http://octanerichmedia.com/ also were present to record footage for their upcoming film about MR CANOE – RALPH FRESE. Join us July 15th for the 5th annual running of the Abe’s River Race! Paddlers will have the opportunity to explore approximately 13.5 miles of the lower Sangamon River as it flows north from Sangamon County past Lincoln’s New Salem Historic Site to Petersburg, Illinois. Registrations can be made online at getmeregistered.com. Registration may be completed in person on the day of the race; however, your Abe’s Race t-shirt may be unavailable in your preferred size. Cost is $30.00 per paddler. Race staff will be at the Irwin Bridge launch site at 7:00 am Saturday to receive your equipment. Shuttles depart Riverbank Lodge at 9:00 am. Please provide yourself sufficient time to drop your equipment off at the launch site and complete your registration and sign-in before 9:00 am. Paddlers should be prepared to launch at 10:00 am and plan to arrive at the finish, Lincoln’s Riverside Park in Petersburg (next to Riverbank Lodge) no later 3:00 pm. Paddler Packets will be distributed post race as paddlers check back in to the registration center at Riverbank Lodge. Your bib tag will be collected and used for prize drawings after the awards are presented. 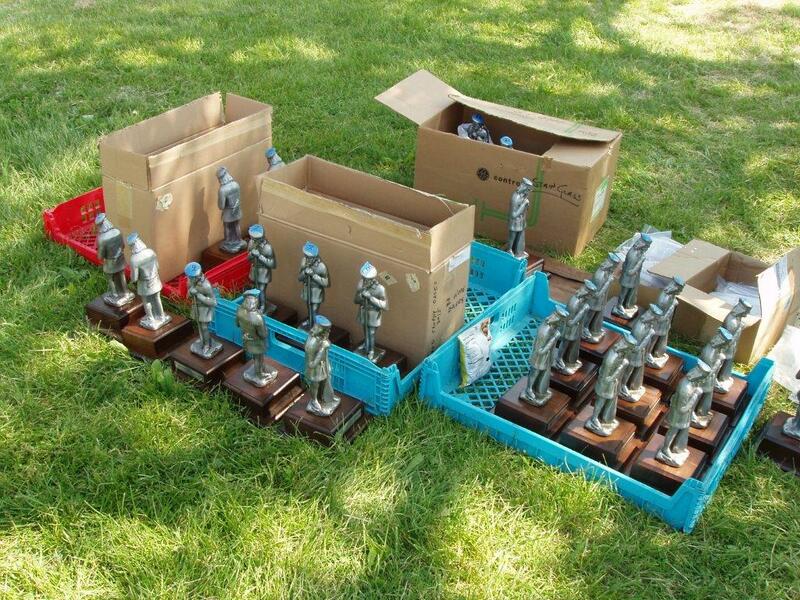 Unique awards will be presented for 1st, 2nd, and 3rd places in all represented divisions. Target time for announcement of race results is 1:00pm, but is dependent upon the finishing times for all racing divisions. Please see flyer below and www.lincolnheritagewatertrail.org for more details. **NEW** Cash awards for the fastest overall time in all adult divisions ($100); fastest youth/youth team in either 18 and under Tandem or Adult and child 12 and under ($50); and best “Spirit of Abe” team or individual ($50). YOU MUST RACE TO WIN! The St. Charles Canoe Club will host its 44th annual Current Buster Canoe and Kayak Race. This long-standing iconic event will take place on May 7th, and has seen local, regional, national, and Olympic champions, as well as “first time” paddlers to the beautiful Fox River Valley. Starting at Pottawatomie Park near downtown St. Charles, the race is nine miles long, four and a half miles upstream and four and a half back, with unique “S” curve buoy turns at the finish line area. For the “relaxed racer,” there is a shorter six mile course up and back; don’t be afraid of the upstream part, because you can paddle near the shore line where there is hardly any current, making for an easy passage. C1 and K1 races are in the morning and C2, as well as rec. kayaks and canoes in the afternoon. See our web page for more detail: http://www.stcharlescanoeclub.com/. You can also find us on facebook. So, don’t be afraid – come on out and enjoy the Fox River. This is also a good way to get ready for the Des Plaines and Mid-American canoe races later. The Core Development Team (CDT) is currently working on developing the final draft of the reporting form that will be used by paddlers to gather the information that will be used to determine the database for the certification. The known entry/exit points and campsites along the river are currently being plotted on a map for a clearer understanding of where gaps are that need to be verified for their attributes, along with the age of the data that might need to be re-verified this summer. The age of some of the existing data might be too old to use and will have to be paddled again for a current condition (aka more than 7-10 years old? and older). Probably not a great loss-who doesn’t like an easy afternoon paddle on an easy flowing, tree-lined avenue? I will be at CanoeCopia this March – on Saturday and Sunday – with a signup sheet for those who would like to help out with the ground-truthing, paddling information-gathering opportunities of the Initiative. I will be at the Prairie State Paddlers’ table (an excellent organization I might add) when I’m not checking out all the cool new gear and info that the fest has to offer. Anyone think a dew rag with the Fox River as an entry/exit map would be a good souvenir to those who help out? Stop by the table and give me your opinion, I’ll listen. The Reel Paddling Film Festival is produced by Rapid Media. Rapid Media also publishes four leading paddlesports magazines: Rapid, Adventure Kayak, Canoeroots and Kayak Angler magazines. Your ticket to a Reel Paddling Film Festival World Tour stop includes a free one-year digital edition subscription to any/all four of the above magazines. Special offer details are available in your evening program. This year we have booked the upstairs area as well, so there will be no outside distractions!